The beautiful Hillsdale House Inn in scenic Annapolis Royal, Nova Scotia, is proud to host a special concert by John Mann on Saturday, December 4, at 7:30 p.m. as part of the popular Homes Routes Concert Series. John Mann pens beautiful melodies with emotionally honest lyrics that capture the intimate moments of his hometown of Vancouver, its occupants, the fragile details of their dysfunctional love and the loss of a city’s innocence. If Damien Rice was Jeff Tweedy and Jeff Tweedy was Josh Ritter, you’d come away with something kindred to December Looms. 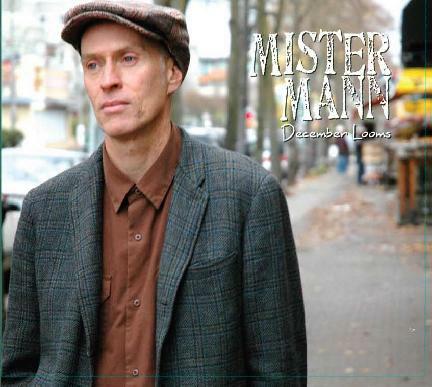 Mister Mann is the solo project of Spirit of the West’s front man and songwriter John Mann. After 11 albums and countless tours of the UK, Europe and North America with Spirit, December Looms is a return to Mann’s stripped down Alt Folk roots. John Mann is also an actor of stage, film and television and currently can be seen on the CBC TV drama Intelligence, as CSIS Director, James Mallaby. The concert will begin at 7:30 p.m. and end around 9 p.m., with a 10-15 minute intermission at the midway point. There is a $15.00 admission charge. Please plan to bring cash, which goes to the artist directly. John’s CD’s will be available for purchase during the intermission and following the performance. A wine & beer cash bar will be available prior to the performance and during the intermission. Advance reservations are required due to limited seating. Please call (902)532-2345 or email reservations@hillsdalehouseinn.ca to reserve tickets. If you are from outside the Annapolis Royal area, why not plan to include the concert as part of a weekend getaway and stay one or two nights. The Hillsdale House will be opening some of their rooms for this weekend and will extend a special room rate of $79.00 plus tax, including full hot breakfast to anyone staying over and attending the concert. In addition to the John Mann Concert, the December 3 – 5 weekend promises to be a fun-filled one in historic Annapolis Royal. The traditional old-fashioned Victorian Christmas celebration will be held at the O’Dell House Museum, Friday and Saturday evening and also on Sunday afternoon. On Saturday morning, December 4, enjoy the Winter Farmers’ Market at the Annapolis Royal Historic Gardens, and then head over to the Legion Social Centre for Annapolis Royal’s annual Christmas Craft Market. Between both Markets and the area’s bevy of unique gift stores, you could work in much of your Christmas shopping. This holiday season, treat youself to a weekend in Annapolis Royal. It’s Historic, Scenic and Fun! This entry was posted in Accommodations, Arts, Explore Annapolis Royal, Gardens, Heritage, Theatre and tagged Annapolis Heritage Society, Annapolis Royal Nova Scotia, Explorer, Hillsadale House Inn, Historic Gardens, What to see and Do, What's Happening. Bookmark the permalink.